Please oh please do not every buy salmon from Costco again. Its farm raised and full of dyes to make it pink. Its the equivelant of eating pink colored cardboard. I just had some wild Copper River Salmon shipped to me from Alaska. I urge you to go to a quality fish monger (ie Santa Monica Seafood) and get some. It won't be as good as the stuff I had shipped directly from Alaska, but even then you will understand why I am so upset you eat Costco Salmon. You will never eat crap Salmon again once you eat wild salmon. I found the best way to cook fish, especially salmon is under the broiler in your oven. Coat the fish with salt and pepper and olive oil. You dont want much to get in the way of your quality fish and you want the fish's flavor to not be covered up. Timing is critical. You want it med-rare when you take it out and the carry over heat will finish the cooking. Its easy to over cook. For a side of fileted salmon thats a whole side, the time is usually about 8 minutes. You get that nice crust you were talking about. Then eat the fish and save the skin. Heat the skin in your toaster oven at about 350 degrees. Keep an eye on it. When it looks crispy but no burnt (its a fine line) take it out. Now you have the salmon skin they put in salmon skin hand rolls at sushi and its a great snack!! Also try puttin you potatoes through a potato ricer (you can get one at a kitchen store). Press it through there and mix gently. You will get perfect, non-lumpy potatoes but the difference is you wont have to mash them so much which can make them "gummy". Looks like you did OK with the asparagus. I like mine grilled after they were covered in olive oil with sprinkling of coarse kosher salt. Asparagus makes you pee smell funny. Please oh please don't get your salmon from Costco again. It really is one of the worst things you can buy in this whole world. Wow, I didn't know how passionate you are against Costco salmon! 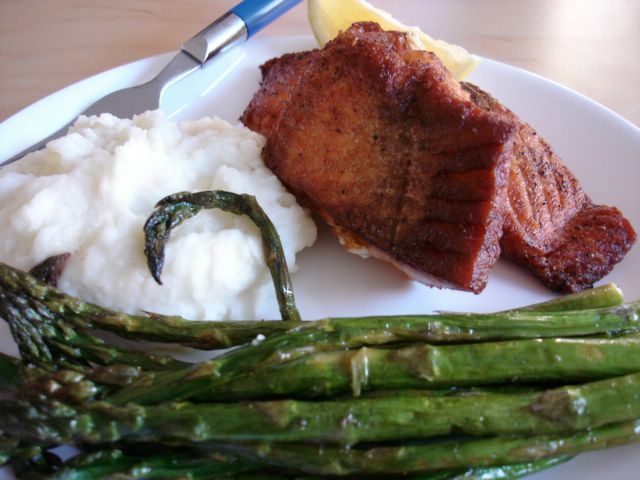 Now I've definitely got to try Copper River Salmon! BTW, I've been to Alaska to have the real deal, although the species I had was called "coho". What species is Copper River Salmon? I noticed also that Copper River season is in full swing now. BTW, I am aware that Costco's salmon is farm raised and has coloring added to it. I'm curious though, are you against buying Costco salmon for concern of the strain salmon farming puts into aqueous environments or are you just against the taste of the fish? I am against it simply because it is pure crap (taste wise and its just a bad product) and better product is readily available and not that much more and such a better choice. It would be like if I went on abut how I had a steak at Sizzler and thought that it was great. Someone would probably post and say that there is better to be had! You obvioulsy care about taste or you wouldnt worry about the details of cooking your fish so much (hence why you posted the blog post). So you obviously are concerned with taste and qulaity or else you would just microwave it. I just got "passionate" because you spent all this time and effort to make a great meal and it could easily be so much better. So how much does Copper River Salmon usually run at Santa Monica Seafood? This is the one over on Newport right? I didnt get mine at santa monica seafood. I got it from mongers directly from Alaska that my friends set up from me. If you do a search on google, there are several sources to purchase from.. you will pay anywhere between 15 bcks a pound to 28 bucks a pound. a pound should feed 2 people at even at the most expensive, thats $14 per serving for something incredibly wonderful and still a deal when you consider a lot of restaurants will not serve you as nice as salmon and charge you more! You dont have to get Copper River. Just make sure whatever you get is wild and fresh! Copper River Salmon is like drinking a limited release bottle of wine. Its special. It wonderful. However you can get much less expensive bottles of wine as long as you buy a quality one..
Elmo - Santa Monica seafood (I'm hoping they still have their outlet in Orange) has Copper River Salmon - when we lived in LA, I'd get my fish from there - expensive but worth it! $28/pound! DAAAAAAAMN! That's definitely not a "work-day" meal...it's a "special occasion" fish! Luckily such an occasion is coming up. Still cheaper than dining out, admittedly. But my lowly mashed potatoes will need to be elevated or replaced...I'm thinkin' "risotto with bits of asparagus" and a "citrus/yuzu sauce" to drizzle around the plate...just like I had at Chat Noir once...MMmmmm. Trader Joes Porcini Cous Cous is awesome to serve with it and is inexpesnive and easy. You dont want to drizlle anything on a fish like this. You want NOTHING to take away from the flavor! The Flavor will 110% stand on its own. Just a littel olive oil and salt and pepper before broiling. Remember to watch it closely. Don't over cook! I don't agree about the Costco salmon. It seems fine for the price. It might not be Copper River, but I've tried for example, the "wild" salmon they sell at TJ's, and I actually found it inferior to Costco. well, thats the important thing. The fact that you like it. At least you tried both and made that determination. Thats all anyone could ask....just try things and formulate your own opinion! Aside fromt the taste, don't you worry about the mercury, toxins, etc in farmed salmon? Mercury in the farmed fish, PCBs in the wild fish. You can't win either way. The jiggling the pan bit for 30 seconds (!) isn't necessary. I eat the farm raised salmon from Costco and I think it tastes fine. The PCB content is another subject which depending who you ask can be higher in either wild or farmed salmon. So I feel like we are getting propaganda from both sides, and I lose my appetite for salmon! You all make a good point. It's just confusing what information or mis-information is out there. I think I'll just give up, eat whatever I feel like eating, and hope for the best. I do not buy farm raised salmon, whether sold at Costco or elsewhere. I actually don't have a problem with the taste - it's actually pretty mild. Most sushi restaurants are serving farmed salmon now. The reason that I won't buy farm raised salmon is because of the negative effect they have on the native populations of salmon. The farm raised salmon are raised in crowded pens in the ocean. They are fed antibiotics to keep down disease in the crowded pens, but disease is still a problem. When the pens are broken by storms or predators, these diseased salmon escape and spread disease to the native, wild salmon. Furthermore, farm raised salmon are Atlantic salmon, not native to the Pacific, which also has a harmful effect on our native populations of fish. Costco does have wild Pacific salmon (e.g. sockeye salmon) in both the fresh seafood part and in the freezer section. This is different from the Atlantic salmon which are farm raised and have dye. I do not buy farm raised salmon, but do buy the wild at Costco. This is seasonal and is usually available July through to Sept. or Oct. They also have the Silver's. Just look at the label...farm or wild. Hey, Costco has farm raised salmon and they have wild sockeye. The wild sockeye is great!! The farm raised tastes fine too, but there are concerns about unhealthy levels of cadmium in Norwegian farm raised salmon, which is where their farm raised salmon comes from. I just bought Wild Alaskan Coho salmon at Costco for $7.99 a pound. I was hesitant because I wonder if there is dye or if it is somehow inferior to the Alaskan Salmon sold at Whole Foods for $20 a pound. It seems good, not absolutely great. Wonder about this...does anyone know the quality difference? Whole Foods told me that Costco Wild Salmon is from warm waters such as California, yet this was clearly labeled Wild Alaskan Coho. NW Pacific Salmon is nearly extinct because the Japs have over fished it. The Sea Bass is next. Just like Talapia which is now the standard like Orange Roughy was several years ago. In 20 years, nearly all fish served in restaurants will be farm raised. Costco sells several varieties of wild Pacific salmon in addition to the farmed Atlantic salmon.